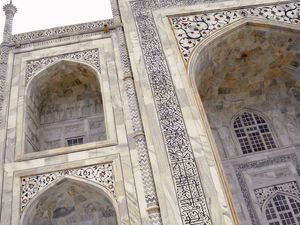 The mausoleum of the Taj Mahal is very largely decorated with floral motifs, mostly engraved in marble or pietra dura, a technique of stone marquetry. But we can not miss the splendid inscriptions in Arabic seems it, inscriptions that run around the iwans (these porches broad traditional Persian architecture). There are also on the entrance gate of the gardens, and on the cenotaphs of Shah Jahan and his wife for whom was built the monument, Mumtaz Mahal. The text is written in a language close to the 'Thuluth', a style associated in particular with the Persian calligrapher Amanat Khan who resided at the Mughal court and who was responsible for making the calligraphy of the entire Taj Mahal. His signature appears besides many times in the marble. Historian Wayne Begley suggests, relatively recently, that Amanat Khan was responsible not only for the practical design of the script, but also for the choice of texts. Most of the texts come from the Koran. There are twenty-two passages in all, including fourteen entire chapters, some of which are read as part of Islamic funeral ceremonies. The chosen texts generally refer to themes of the judgment and reward of the faithful, with their entries to Paradise. 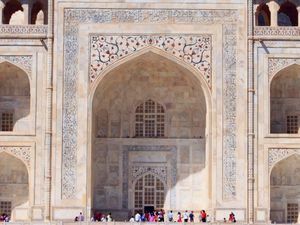 Moreover, the inscription on the entrance gate of the gardens of the Taj Mahal invites the reader to enter Paradise, the home of the faithful and the reward for the righteous. Its presence on the gateway to gardens is not trivial because gardens are a representation of Paradise according to Islam, especially that of the Taj Mahal, which was really designed as such. As we get closer to the mausoleum, the text changes its tone. While at the entrance it was an invitation to enter Paradise, the inscriptions on the outer walls of the tomb leave no doubt about the impending disaster awaiting the infidels, the day of judgment. It is a message of severity that is distilled, and it contrasts a lot with the sweetness of architecture, which is rather a symbol of love than a warning. Inside the mausoleum the tone is more reassuring, with long descriptions of Paradise adorning certain walls. 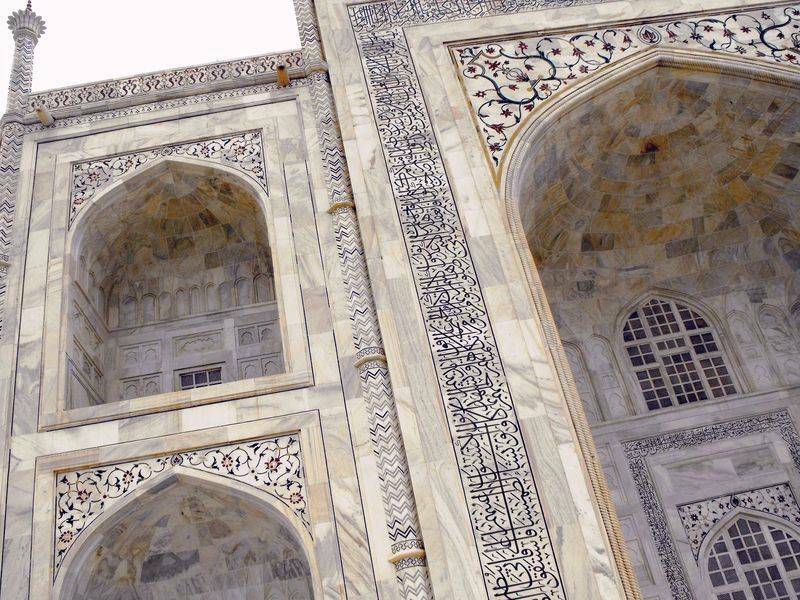 The main text, and finally the most important one, is on the upper cenotaph of Mumtaz Mahal. The words of the Qur'anic prayer, recited by angels, implore Allah to allow the faithful to enter Paradise, a touching request for God's mercy to his devoted servant, Mumtaz Mahal. 48: Victory (29 verses). These verses speak of the "Treaty of Hudaybiyyah" which provoked the first pilgrimage. 67: The Kingship (30 verses). These are sentences that put forward man's dependence on guiding souls to divine revelation. 77: The Envoys (50 verses). This refers to the revelation of the Qur'an. 98: The Decisive Proof (8 verses). This text explains the need to send a messenger to Earth with the Qur'an. Verse 58 of Sura 36 is "Peace, this is the word that will be spoken to them from a merciful Lord." This is one of the few verses that evokes the contact between God and humans. Both tombs are also covered with calligraphic inscriptions referring to the Koran. 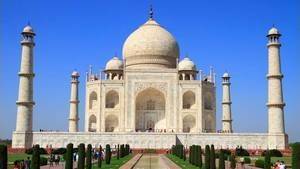 Thus on Mumtaz Mahal one can read the ninety names of God, on the sides of the tomb, in the crypt. There is, for example: "O Noble, O Magnificent, O Unique, O Lord, O glorious, etc.". That of Shah Jahan bears the calligraphic inscription "He traveled from this world to the banquet hall of eternity on the night of the twenty-sixth of the month of Rajab, in the year 1076 Hijri". However, the central point is filled with passages from the cenotaph of Mumtaz Mahal. The words of the Qur'anic prayer recited by the angels, implore Allah to allow the faithful to enter paradise, a moving request for the mercy of God to His devoted servant, Mumtaz Mahal. These inscriptions are in Arabic, but a bit of a special Arabic nowadays. They are made of black marble are used both to spread a message and to decorate. 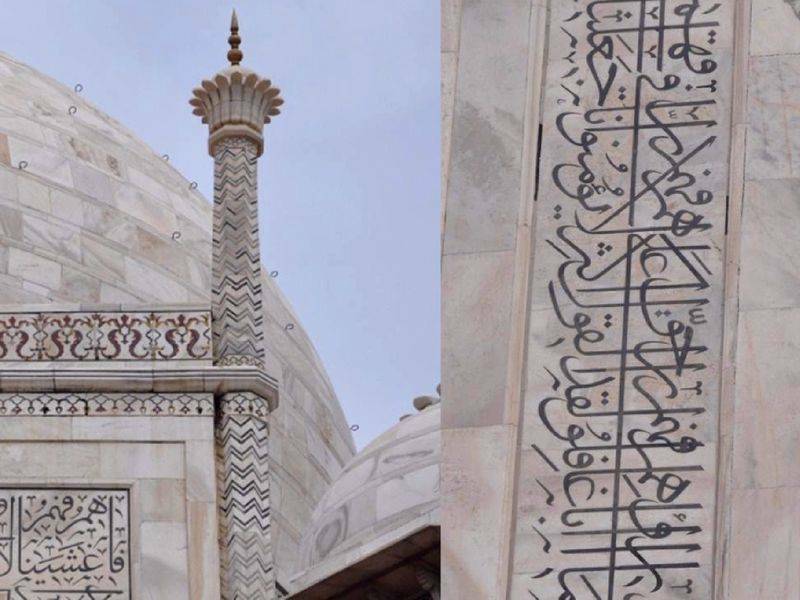 The black marble lettering is inlaid on white marble slabs that highlight the architectural features of the monument. The rounded letters have a generally elongated shape, mostly horizontally, but this alternation of vertical and horizontal lines gives the impression that it is a grid. 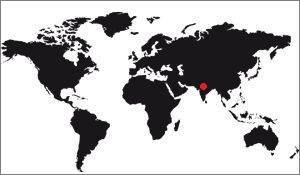 The stone used for writing is black marble. It is not veined with white as often, this stone is a deep black. In addition, the calligrapher Amanat Khan had designed the text so that all the letters turned to the viewer with an identical size. To make this effect he had to enlarge the highest signs because the visitors see them closely. It is a technique that requires a great mastery of perspective, proof of the great capacity of the Mughal culture to create decorations of great qualities. The work of incrustation stones in a support also stone must be of great precision. The artists who worked on the Taj Mahal were endowed with a capacity for concentration and meticulousness, because in many places the quality is irreproachable. Moreover this quality of execution of the works is one of the elements proving the success of the whole building. To make these inlays have used the technique of pietra dura. It is a simple method developed by the lapidaries of Florence, Italy, who were masters in the art of stone marquetry. It was they who carried out a large part of the incrustation work, having moved to India to bring their know-how. In practice, the principle is to abrade a marble plate serving as a support until it is perfectly polished. Then, the artist makes a sketch of the drawing to realize and cuts in the stones corresponding to the good colors the forms to be incrusted, like parts of a puzzle. Finally, it carries over on the marble plate the contour of the cut stones and digs until obtaining a cavity corresponding to the stone. We imagine the precision needed for the two parts to become perfectly embedded, as well in width as in length, and even in depth, because if at the end the artist polished again the marble plate to level everything , it was not necessary too much difference in height between the support and the stone. This method is called pietra dura, it is still used nowadays. This is the same method that was used for flower pattern inlays. The decorations on the Taj Mahal.